The Panthers are tasked with replacing all five starters for the second time in three seasons. Another season, another opportunity for the Whitman-Hanson Regional High boys’ basketball team. It’s a chance for it to make its own mark in the history of a program that, over each of the past six seasons, has won at least 16 games and has qualified for the last 10 Div. 2 South Sectional tournaments, while making a pair of trips to the TD Garden for the state semifinals. After the graduation of all five starters from last season’s 16-5 team, the starting lineup – similar to 2016 – is blank after the first week of practice, just waiting for five players to emerge. That team went on to win the league title and compete in the state semifinals at the TD Garden. “It’s just a matter of getting the guys on the same page and trying to figure out what we have in terms of assets,” Rodgers said. Also similarly to the 2016-17 team, Rodgers said he expects the Panthers to return to being a good shooting team from inside and outside the arc. Last season’s team struggled with its ability to knock down shots. Sean Leahy, now playing at UMass Dartmouth, willed the Panthers to many victories last season, averaging nearly 20 points and 10 rebounds a contest en route to Patriot League Keenan Division MVP honors. Fellow senior captain and Patriot League All-Star Jacob Hanson-Bartlett pumped in 12.3 points a game. Both of their production will be missed. Rodgers said it’s really hard for him to pinpoint who will shoulder the load on offense this season. Of the Panthers’ returnees,senior guard Tajh Hunter has the most experience under his belt, having accumulated 381 minutes on the floor last winter. Senior guard Cole Lewis and junior guard Max Borgen are the only other two returnees with over 200 minutes of varsity playing experience. 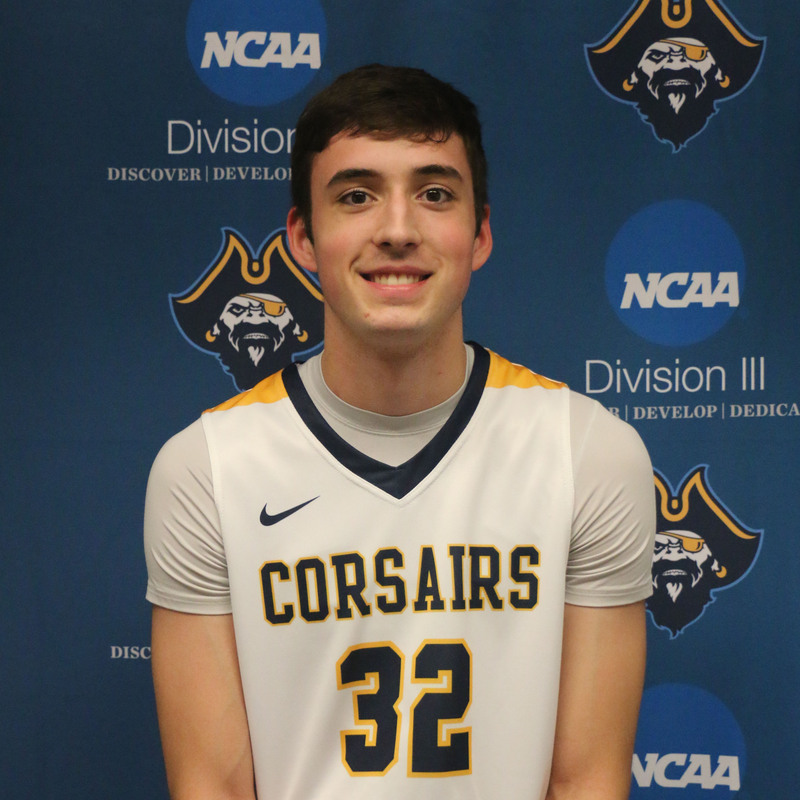 Senior guard Joey Depina, who received just 90 varsity minutes last season, will captain the team. Rodgers said that while he isn’t returning a ton of experience at the varsity level, he can’t complain about the work put in by most of his players over the offseason. Rodgers said he believes his team’s strength is its togetherness, and his players will deal with adversity as a unit. Rodgers said he’s focused on getting everyone working toward the same mission, while improving along the way. The Panthers open the season Tuesday, Dec. 11 at home against league foe Quincy at 6:30 p.m. This is the second straight season, and third time in the last five years both W-H basketball programs have earned a spot in the postseason. 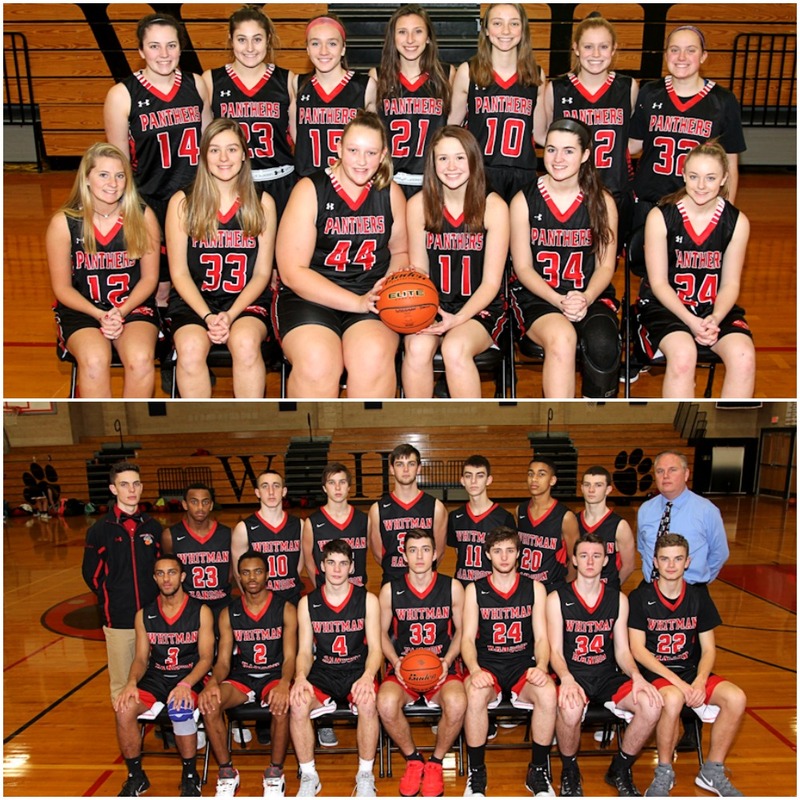 The Whitman-Hanson Regional High boys’ and girls’ basketball teams have punched their tickets to the tournament. 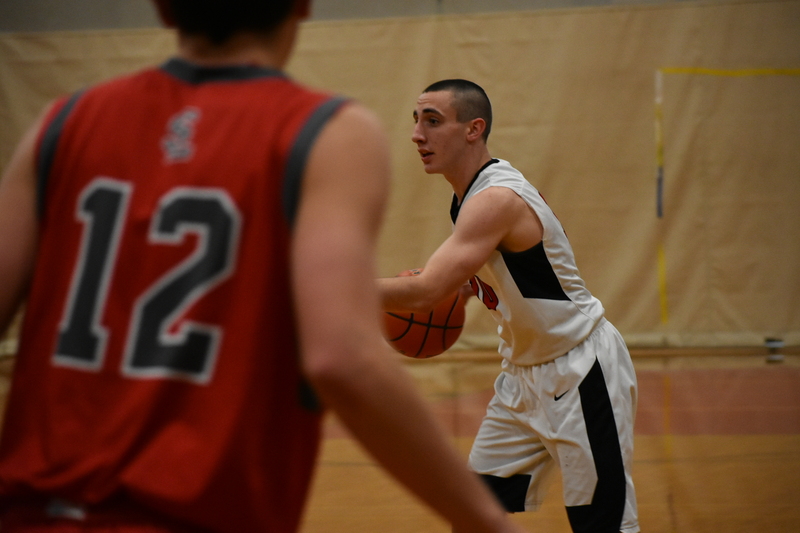 The boys’ team (14-4, 12-2 Patriot League) clinched its berth with a 70-53 rout of Plymouth North at home on Friday, Feb. 2, giving it its 10th win of the season. The Panthers were in command for much of the contest, leading by double digits essentially all evening, but did have to thwart a Blue Eagles charge that sliced their lead to seven in order to claim victory. “After the game, I congratulated the kids on checking off one of their goals but [said] that we had several more to go,” W-H boys’ basketball head coach Bob Rodgers said. In the victory, senior captain Sean Leahy led the way with 19 points and fellow senior captain Jacob Hanson-Bartlett chipped in 12. Not only did it give the Panthers their 10th win of the winter, but it also marked the 10th straight season the boys’ program has qualified for the Division 2 South Sectional tournament. But as Rodgers stated, the Panthers, who have clinched two straight Patriot League Keenan Division titles, and been to two straight Division 2 state semifinals, their eyes are on a much bigger prize. As for the girls’ team (12-7, 8-6), they had a little more work to do if they wanted to head back to the tournament. Playing a 21-game regular season, the Panthers had to win at least 11 of their tilts. Down 24-21 at halftime Tuesday, Feb. 6, on the road against Pembroke, the Panthers weren’t about to fold over. Two key aspects of their campaign this season have been their depth and defense, both of which played a key role in the second half, as they held the Titans to 12 points in the second half to claim a 51-36 victory, securing their spot in the playoffs. During that second-half charge, junior captain Erin Leahy (11 points and 10 rebounds) secured a double-double, fellow junior captain Kathryn Dunn caused the Titans fits on the defensive end of the court, classmate Olivia Johnson sank two key 3-pointers, junior Leah Badger tallied seven points and sophomore Olivia Martin connected on two pivotal left-handed layups. “The number one thing we wanted was to come out with urgency from tipoff,” W-H girls’ basketball head coach Jenna Olem said. “It was awesome to see a bunch of players who work so hard during the week step up and contribute to the win. This marks the second straight season the Panthers have qualified for the tournament. But, there is a wrinkle in that this year as they were moved up to Division 1 over the offseason, so they will have to get past some top-tier competition if they hope to advance come March. W-H and Quincy are the only two Patriot League schools to have qualified both basketball teams for the postseason. The girls continue competition Thursday, Feb. 15 on the road against Quincy at 6:30 p.m. The boys will be back in action Friday, Feb. 16 at home against Quincy at 6:30 p.m.
Bob Rodgers is looking for much of the same out of his boys’ basketball team that’s made it to the Div. 2 state semifinals two straight seasons. After back-to-back trips to the Division 2 state semifinals, the Whitman-Hanson Regional High boys’ basketball team is gearing up for a new season. “Each team has its own personality and its own character and from a coach’s perspective, it’s a lot of fun to figure out what’s the best way to motivate them, how to coach them, how to get the most out of them,” said Bob Rodgers, who is entering his 18th year at the helm of the Panthers. Key losses from last winter’s club are Lucas Franklin, Nikko Raftes and Luke Tamulevich, all of whom were senior captains and pivotal pieces of that team. “There’s no question that all of those guys have left a legacy in the program, in terms of how hard they wanted to work and how they treated their teammates,” Rodgers said. Franklin, Raftes and Tamulevich were three of five players penned into starting roles at the outset of last season, as the Panthers were tasked with replacing their entire starting five. This winter, the Panthers will only be replacing three starters, as they return Jacob Hanson-Bartlett and Sean Leahy. Hanson-Bartlett (179 points and 167 rebounds last season) and Leahy (141 points and 154 rebounds) both flourished as first-year starters en route to many postseason accolades. Not only will both be relied on to be the focal points on the court, but off it as well as both have been tabbed as captains. As for who will join them as starters is still to be determined at this point. Rodgers said one idea that he is toying with is starting a bigger lineup than in previous seasons. Rodgers said he is also flirting with the idea of playing without a point guard, something he did in 2010. One of the Panthers’ strengths last season was their ability to knock down the 3-pointer, which was fueled by sharp-shooters Raftes and Tamulevich. Rodgers said that despite W-H’s increased size this season, the program is still brimming with excellent shooters who can connect from beyond the arc. 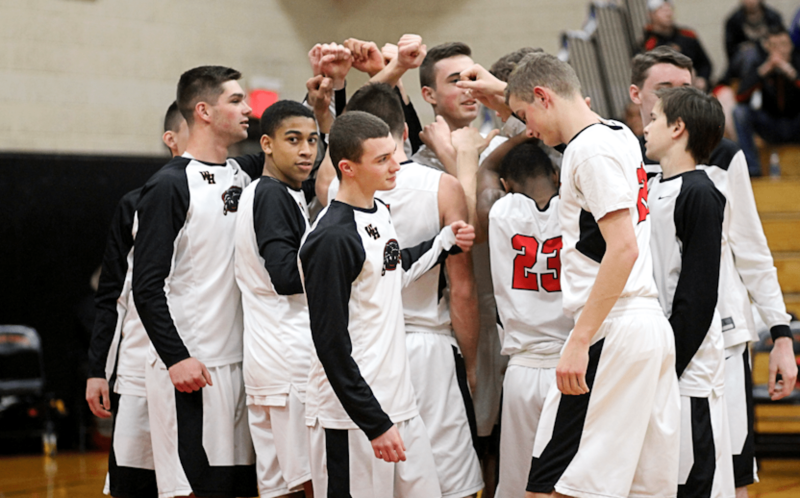 The Panthers will open the season at Bridgewater-Raynham on Tuesday, Dec. 12 at 6:30 p.m. Playing in front of a sea of red Monday evening at historic TD Garden, Whitman-Hanson fell to Brighton by the final score of 94-48 in the Division 2 state semifinals. BOSTON — The Whitman-Hanson Regional High boys’ basketball team’s improbable tournament run has come to a close. North champion Brighton (22-5) stepped on the gas pedal early on and never let up, as its 3-point shooting and presence inside proved too much for South champion W-H (19-4) to handle. The 94 points are the most allowed by the defensive-minded Panthers all season. The Bengals darted out of the gate – connecting on seven of their first 11 attempts – and a Tyrone Perry 3-pointer gave Brighton a 16-7 lead with 3:24 remaining in the first quarter. Down 18-7, the Panthers would score the next five points via a Luke Tamulevich layup and Nikko Raftes trey, to pull back within single digits, 18-12. However, Brighton would respond – outscoring W-H 11-2 to close the opening frame to push ahead 29-14. The Panthers buckled down on defense in the second quarter – limiting the high-powered Bengals offense to 16 points – but could only muster 12 points themselves and fell behind 45-26 at halftime. The third quarter proved decisive for Brighton – which shot 10 of 13 from the field  as it outscored W-H 31-9 to build a commanding 76-35 cushion. Up substantially, Brighton didn’t let up in the final frame – holding W-H to 13 points while pumping in 18 (six via treys) itself to further pad its victory. Sophomore guard Tajh Hunter netted four of the Panthers’ fourth-quarter points. W-H, despite the loss, was able to cycle in all of its players onto the court. Seniors Raftes and Tamulevich, like they have done all season, led the Panthers in scoring with 11 points apiece. Junior Sean Leahy chipped in five points and four boards as nine Panthers, including seven players set to return in 201718, tallied points. “It was awesome that a lot of the guys were able to get some points and get that ability to play at the [TD] Garden, it will be a life memory for them, and I guess that was one of the bright spots when you have a game like that,” Rodgers said. 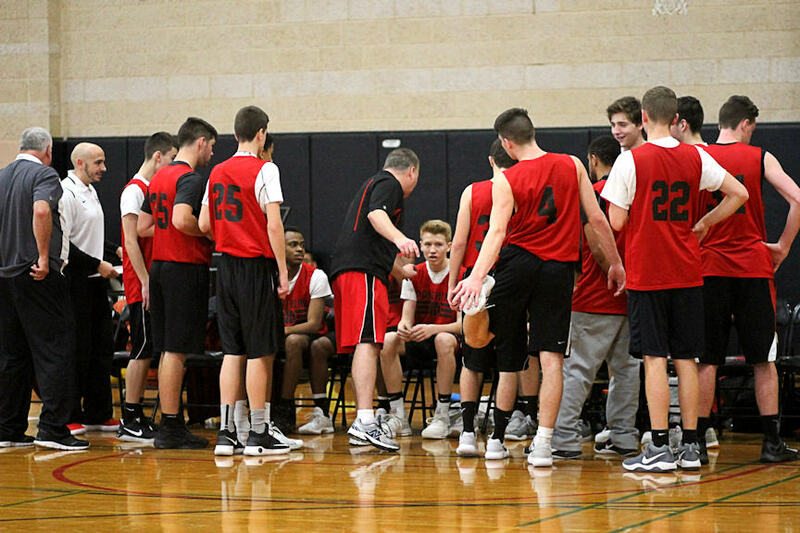 With a 56-42 victory over Hingham, the Whitman-Hanson Regional High boys’ basketball team has won its league for the second straight season. WHITMAN – On Friday, Feb. 10, the Whitman-Hanson Regional High boys’ basketball team felt a sense of accomplishment. 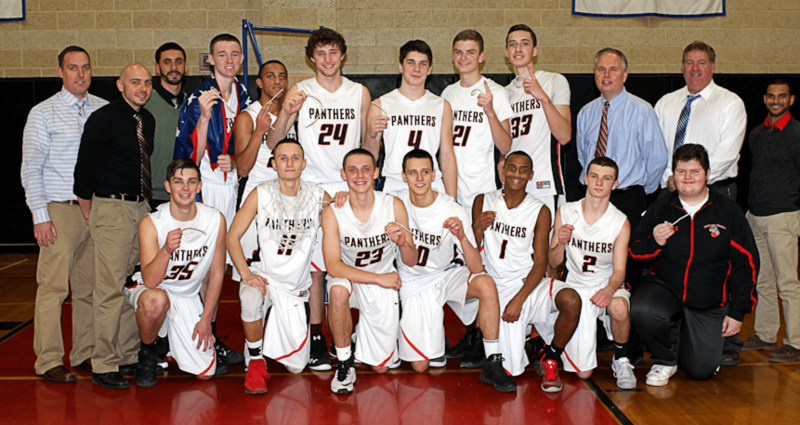 The Panthers defeated Hingham, 56-42, to capture the Patriot League Keenan Division, giving the program back-to-back titles for the first time. 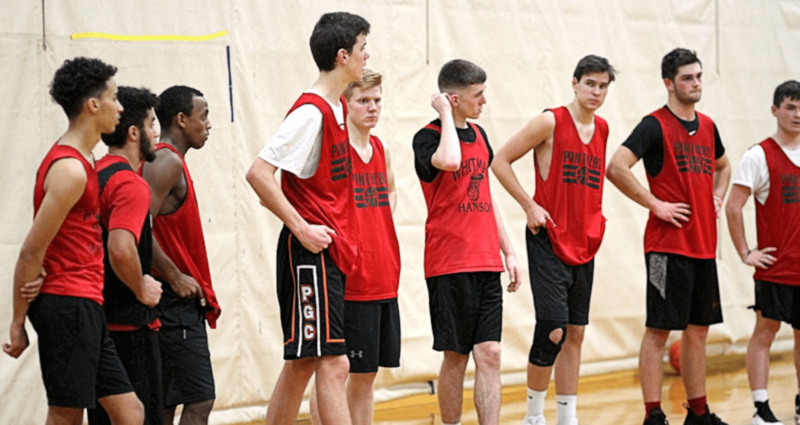 W-H, which graduated eight seniors, including its entire starting five, from the roster that made it to the Division 2 state semifinals last year, has defied all odds thus far. When W-H (13-3, 11-2) needed a basket, Nikko Raftes was there to deliver. 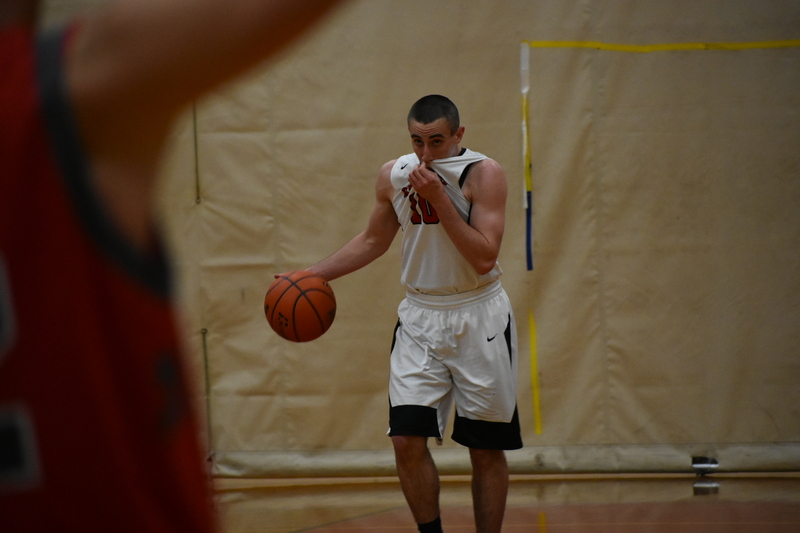 The Panthers, who led by as much as 10 in the fourth quarter, watched their advantage shrink as Hingham (8-8, 8-5) sliced its deficit to five, 45-40, midway through the final frame. On W-H’s next trip down the court, Raftes drilled a turnaround jumper to push the Panthers lead to 47-40. On the ensuing W-H possession, the senior captain then spotted up from beyond the arc and drilled a 3-pointer to push the Panthers cushion to 10, 50-40, all but sealing their victory. Two Raftes free throws in the final minute made it a 56-42 game. Hingham would battle back behind the play of center Logan Larsen, and pulled ahead 12-11 at the end of the opening quarter. W-H would begin to drive to the basket to begin the second quarter, despite the lengthy presence of Larsen inside, which opened the floor for four treys in the frame. With W-H trailing 24-23, Raftes drilled a 3-pointer to push it ahead by two, igniting an 8-0 run. Hingham followed up the triple with a pair of fouls, two missed field goals and a turnover. Tamulevich’s trey with under a minute remaining in the second quarter  giving W-H its largest lead of the first half, 31-24, capped off the run. The Harorbmen sliced their deficit to as few as six in the third quarter, but W-H allowed just three field goals in the stanza to retain its lead. Tamulevich led all scorers with 19 points, Raftes chipped in 15 and Jacob Hanson-Bartlett added 10 points and seven boards (five offensive).